Boom 11 m - 33,5 m (36 ft - 110 ft) four (4) section, full power sequenced synchronized boom.Maximum tip height: 35,9 m (118 ft). Folding lattice extension 10,1 m - 17,1 m (33 ft - 56 ft) folding lattice swingaway extension offsettable at 0°, 25° or 45°. Stows alongside base boom section.Maximum tip height: 52,6 m (172.5 ft). *Lattice extension Two (2) 6,1 m (20 ft) lattice extensions used with the swingaway extension to increase the length to 23,2 m (76 ft) or 29,3 m (96 ft). Maximum tip height: 64,6 m (212 ft). Boom nose Quick reeving type boom nose with 3 nylatron sheaves (TMS750E), (4 for TMS760E [ 55 t (60 USt) rating]) mounted on heavy duty tapered roller bearings with removable pin-type rope guards. Removable auxiliary boom nose with removable pin type rope guard. Boom elevation One double acting hydraulic cylinder with integral holding valve provides elevation from -3° to 78°. Load moment and anti-two block system Standard "Graphics Display" load moment and anti-two block system with audio-visual warning and control lever lockout. These systems provide electronic display of boom angle, boom length, radius, tip height, relative load moment, maximum permissible load, load indication and warning of impending two-block condition. The standard "Work Area Definition System" allows the operator to pre-select and define safe working areas. 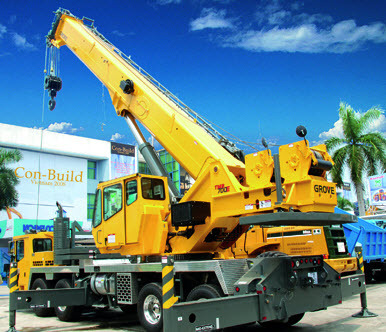 If the crane approaches the pre-set limits, audio-visual warnings aid the operator in avoiding job-site obstructions. Swing Planetary swing with foot applied multi-disc wet brake. Spring applied, hydraulically released parking brake. Two position plunger type and 360° mechanical house locks operated from cab. Maximum speed: 2.0 rpm. Counterweight 4990 kg (11,000 lb) consisting of (2) 2495 kg ( 5500 lb) sections. *Optional "Heavy Lift" package consisting of (1) additional 2495 kg (5500 lb) section, for a total of 7484 kg (16,500 lb). Hydraulic installation/removal. Hydraulic system Four main gear pumps with a combined capacity of 513 L/m (135.4 gpm). Individual pressure compensated valve banks. Maximum operating pressure: 27,6 Mpa (4000 psi). Return line type filter with full flow by-pass protection and service indicator. Replaceable cartridge with beta rating of 5/12/16. 643 L (170 gal) reservoir. Remote mounted oil cooler with thermostatically controlled electric motor driven fan. Chassis Triple box section, four-axle carrier, fabricated from high strength, low alloy steel with towing and tie-down lugs. Outrigger controls Located in the superstructure cab and both sides of chassis. Level indicator at each control station. Engine Cummins QSM 11 six-cylinder, turbo-charged and after-cooled diesel engine. 10.8 L (660 in3 ), 300 kW (402 bhp) at 1800 rpm. Maximum torque 1898 Nm (1400 lb-ft) at 1400 rpm. Tier III "Off-Highway" EPA, CARB and EU Stage IIIA compliant. Equipped with engine compression brake, audio-visual engine distress system and ether cold start aid. Fuel Requirement: Maximum of 5000 ppm sulfur content. Fuel tank capacity 379 L (100 gal). Transmission Roadranger 11 speeds forward, 3 reverse, manual. Drive Drive 8 x 4 x 4. Steering Front axles, single circuit, mechanical steering with hydraulic assist. Axles Front: (2) beam-type steering axles, 2,1 m (83.3 in) track. Rear: (2) single reduction drive axles, 1,9 m (75.1 in) track. Inter-axle differential lock. Brakes S-cam, dual system operating on all wheels. Spring applied air released parking brake acting on rear axles. Air dryer. Suspension Front: Walking beam with air bags and shock absorbers. Rear: Walking beam with air bags and shock absorbers. Lights Full lighting package including turn indicators, head, tail, brake, and hazard warning lights. Cab One man design, all steel fabricated with acoustical lining and tinted safety glass throughout. Deluxe fabric covered, fully adjustable air ride seat. Complete driving controls and engine instrumentation including tilt telescope steering wheel, tachometer, speedometer, voltmeter, water temp., oil pressure, fuel level, air pressure gauge with A/V warning and engine high temp./low oil pressure A/V warning. Other standard items include hot water heater/defroster, electric windshield wash/wipe, fire extinguisher, seat belt, air conditioning, air horn and door lock. Electrical system Three (3) 12V batteries. 12V lighting/starting. Battery disconnect standard equipment. Miscellaneous standard equipment Aluminum fenders with rear storage compartments; dual rear view mirrors; electronic back-up alarm; pump disconnect; tire inflation kit; air cleaner restriction indicator; headache ball stowage; chrome package which includes aluminum wheels, hoist access platform, LMI event recorder and CraneSTAR asset management system.